2) Allow to grow from a small project to a big one. 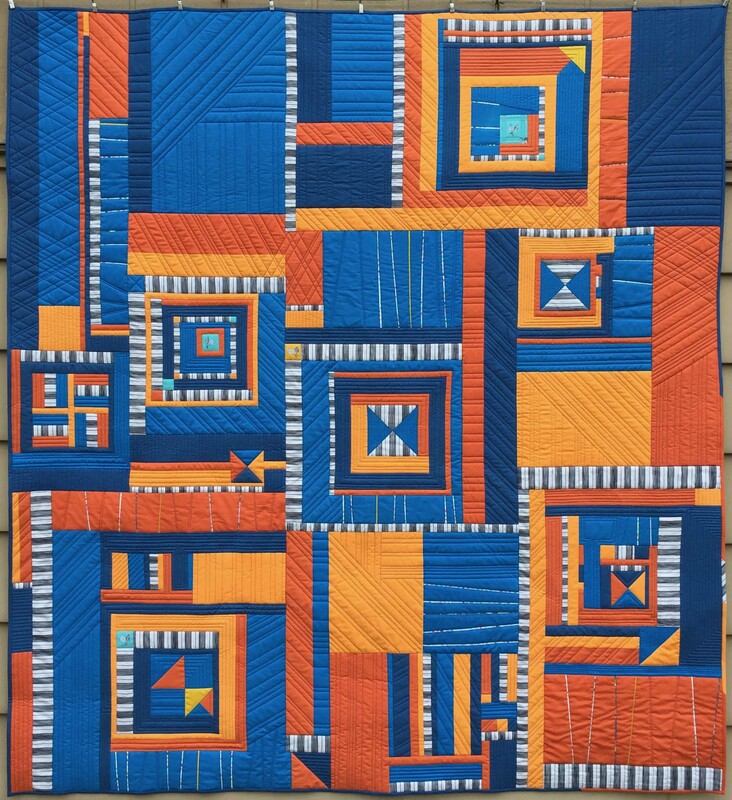 My Michael Miller Challenge quilt was definitely the second. 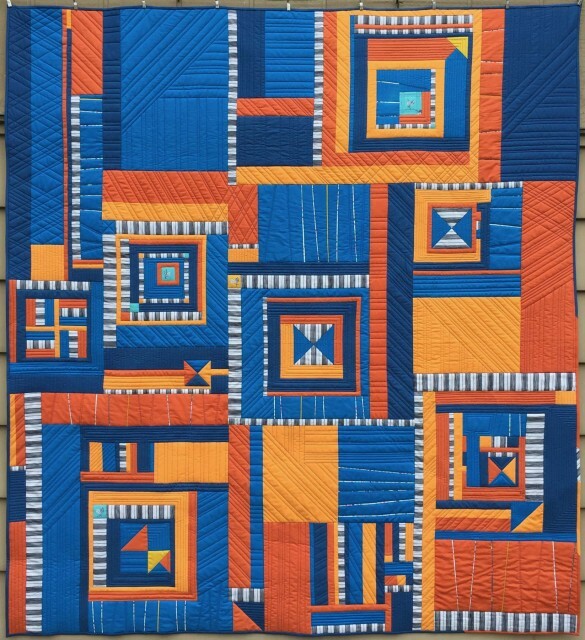 It was going to be a small-ish wall quilt, but it ended up being a generous lap quilt at 63″x69″. “Overlay” is my second entry and is entered in the Modern Traditionalism category. This was also my entry in the Riley Blake Challenge earlier this year. 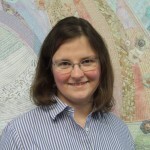 I really hope this one gets in- it is a personal favorite! 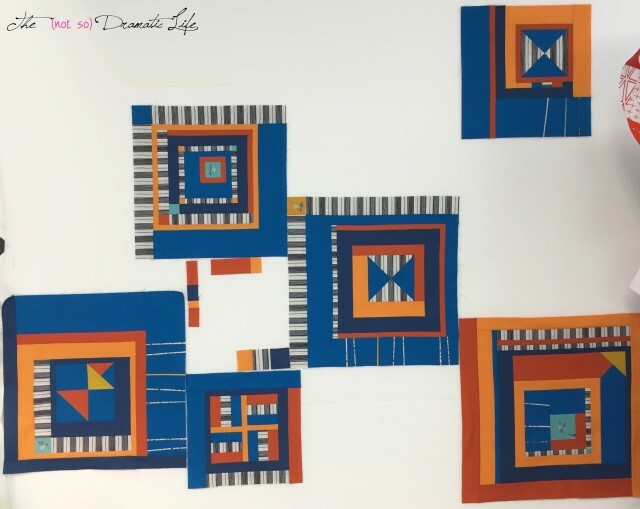 For my negative space entry, I continued exploring the idea of highlighting the use of thread to tell the story of the design. 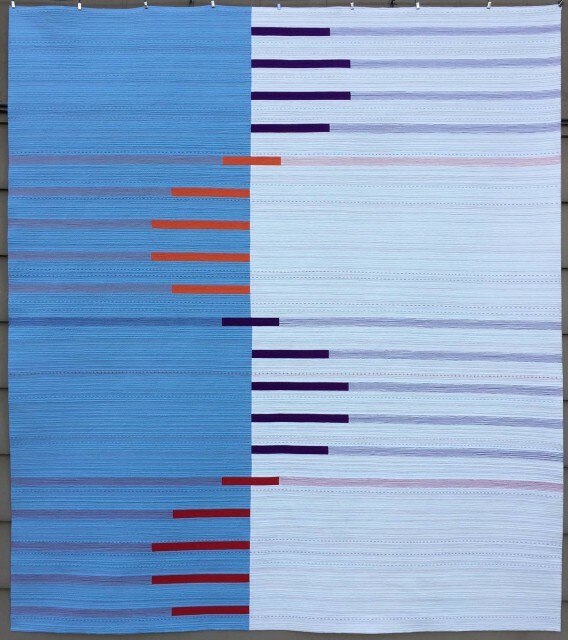 “Lateral Ascension” is entered in the Minimalism category. 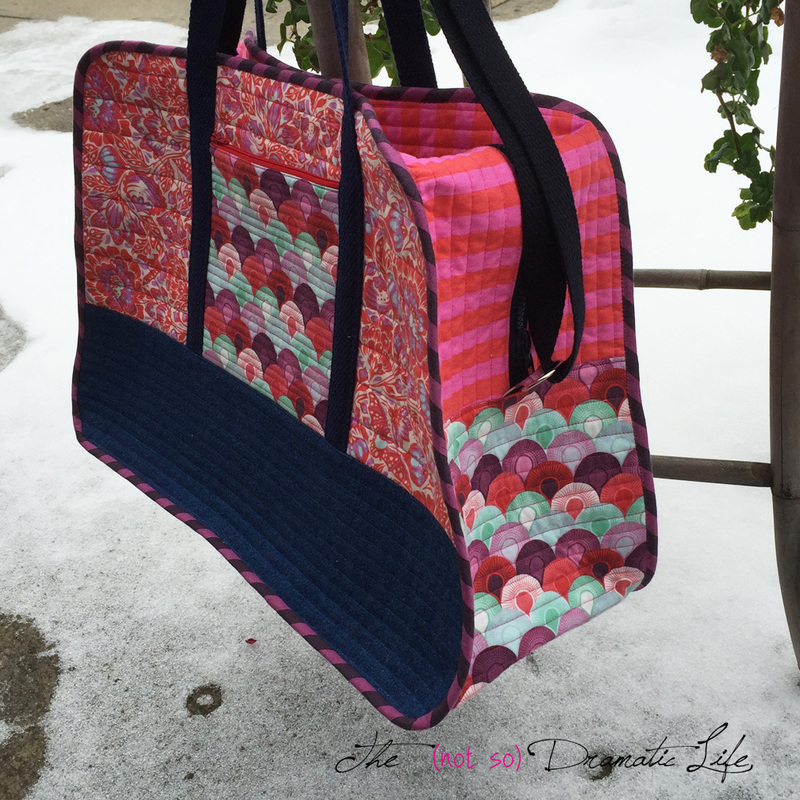 The design is inspired by the drafted front elevation of a spiral staircase. 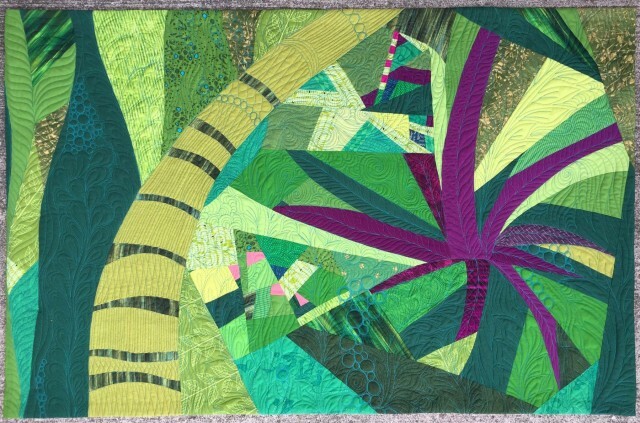 “Franklin Park/Greenery in the Garden” is the only quilt I have actually written a more in depth post about. It is entered into the Improvisational category. 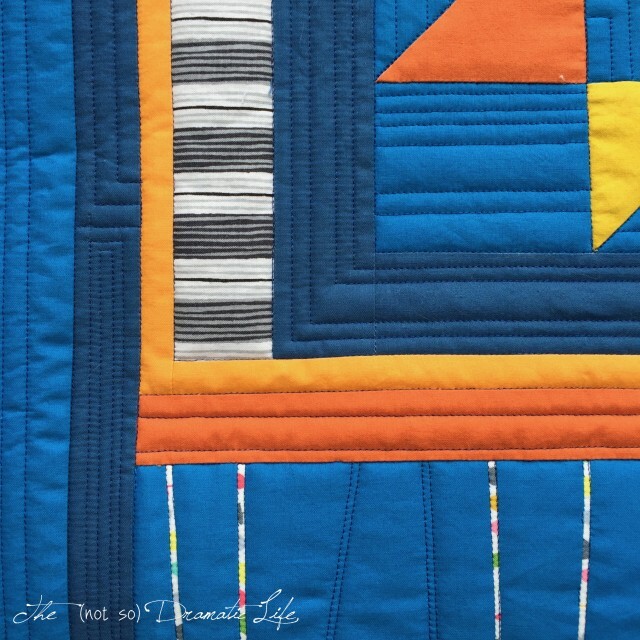 I have been away from the blog for awhile, and I am really missing it. 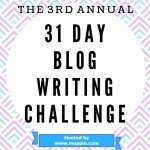 In the hopes of encouraging myself to make it more of a habit to blog, I am going to try participating in the 31 Day Blog Challenge hosted by Cheryl Sleboda at muppin.com. There has been so much happening in my quilt-y world lately, but not everything needs its own post, so I’m combining a bunch of cool stuff into a single post! 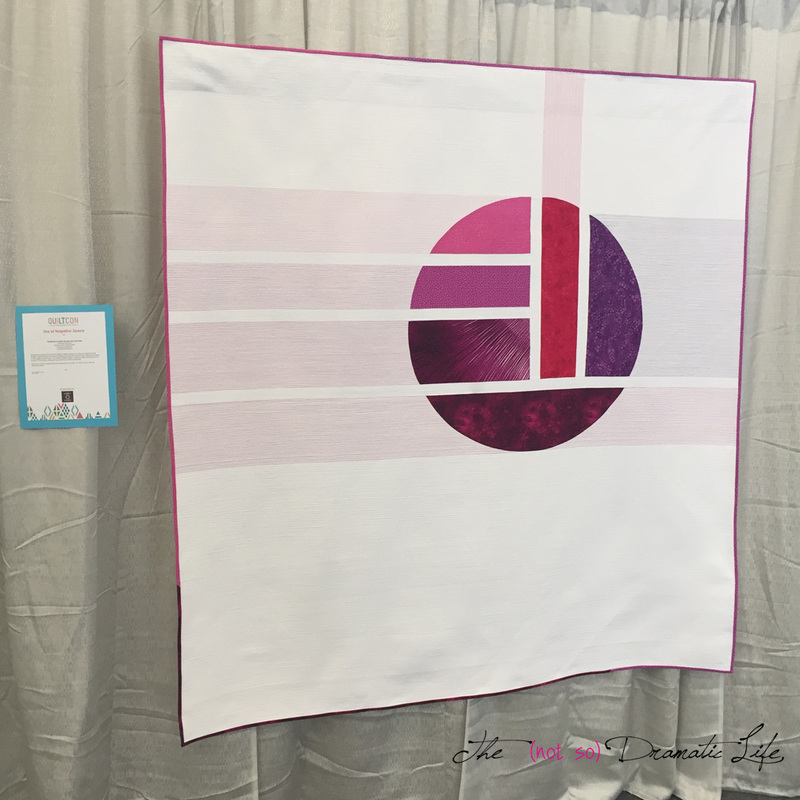 I had a wonderful time at QuiltCon and it was just as exciting to have my quilt returned to me the following week. Next up in quilt shows: I have THREE quilts heading to the American Quilter’s Society Show in Paducah this Spring! I was stunned and thrilled to receive three positive notifications, and I am eagerly awaiting the show. 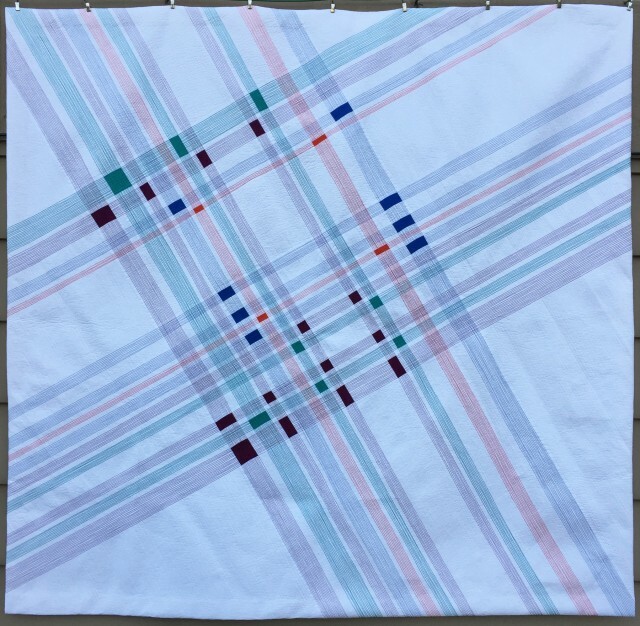 The Whole is Greater Than the Sum of Its Parts will continue its show tour in the Large Wall Quilt: Modern category, and will be joined by both Can You See (m)E Now? 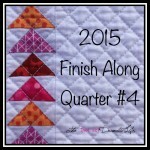 in the Small Wall Quilt: Pictorial category and Rainbow Rotary in the Miniature category. Even more exciting than having my quilts in the show is seeing that these, as well as several other quilts in the modern aesthetic are being accepted into the show in categories stretching well beyond the modern category. 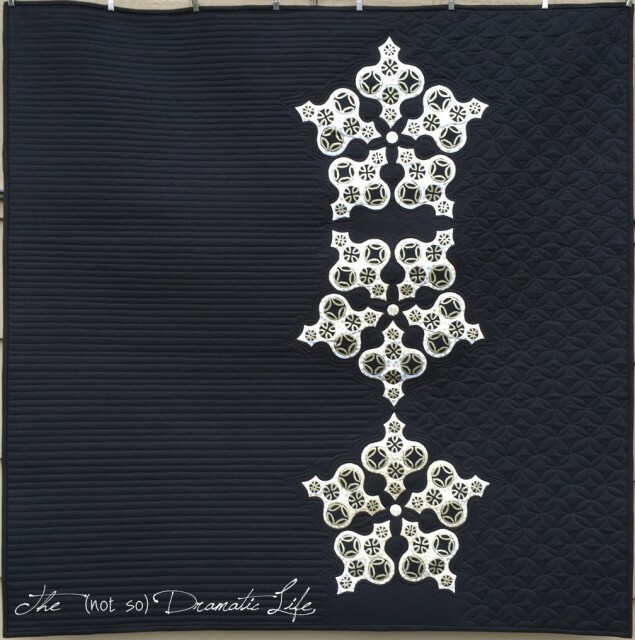 It is fabulous to see wonderful, long established shows, embrace the differences in the quilt world. 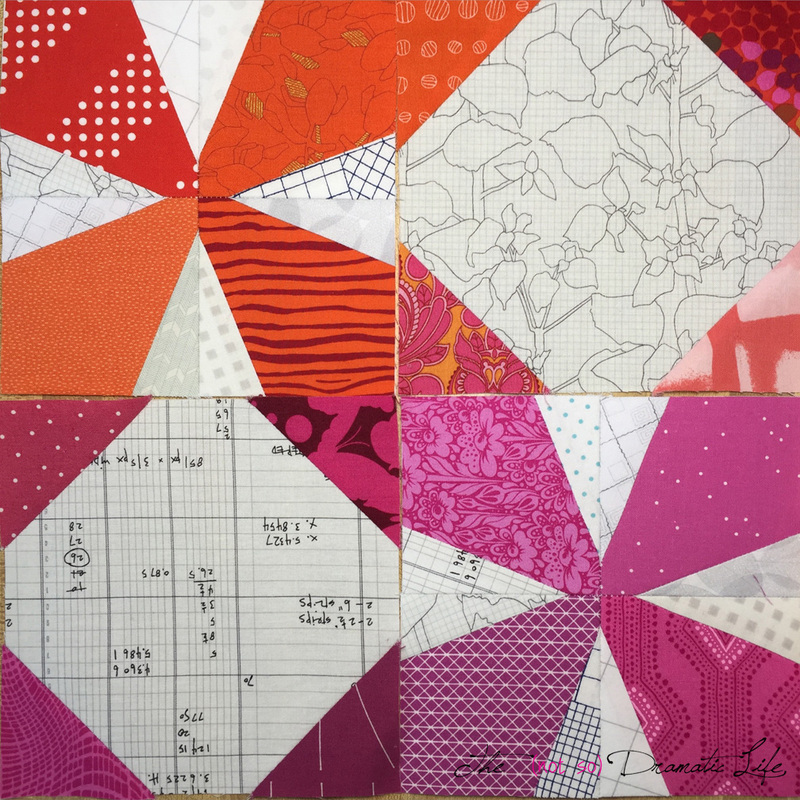 The Collection Quilt block of the month classes I have been teaching at Sew to Speak in Columbus, Ohio have been going well, and it is so much fun to work through this delightful quilt with such a wonderful group of women. I have been making a version of this quilt that is perfect for a princess loving little girl. 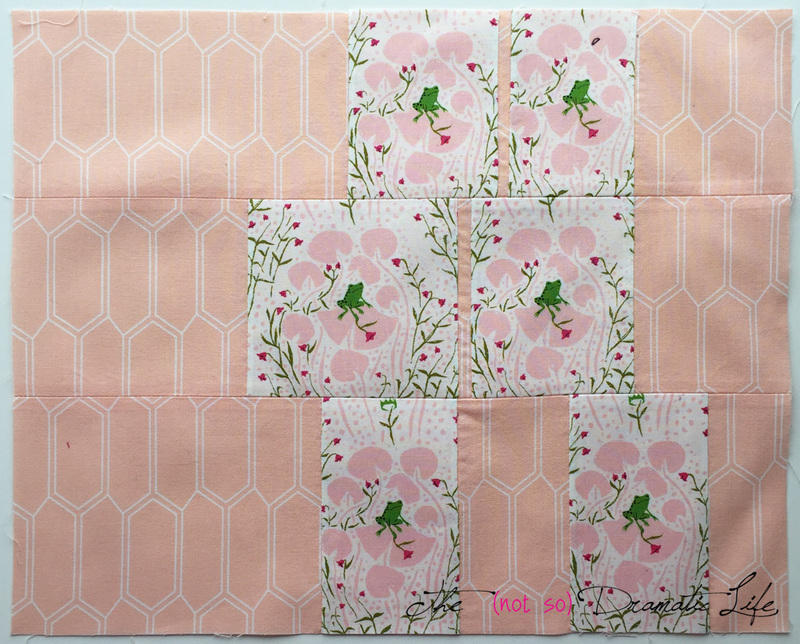 The first month’s block features this cute frog print. 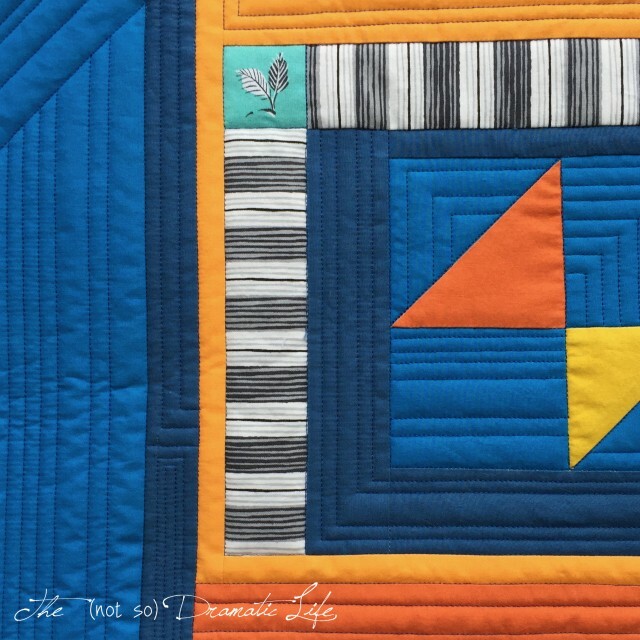 Block two is especially fun due to the opportunities to incorporate lots of fussy cutting! If you are in the Columbus area, and would like to join the class, we would love to have you! 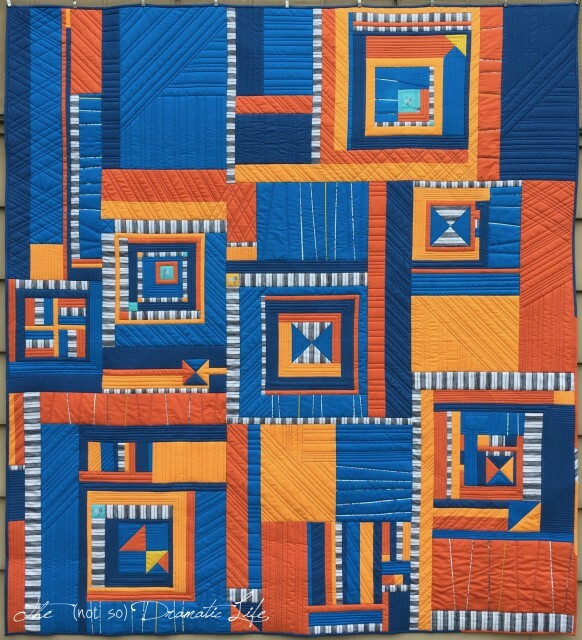 There is still plenty of time to learn the technique and come out of the class with a fantastic quilt. Please contact Sew to Speak to get signed up! 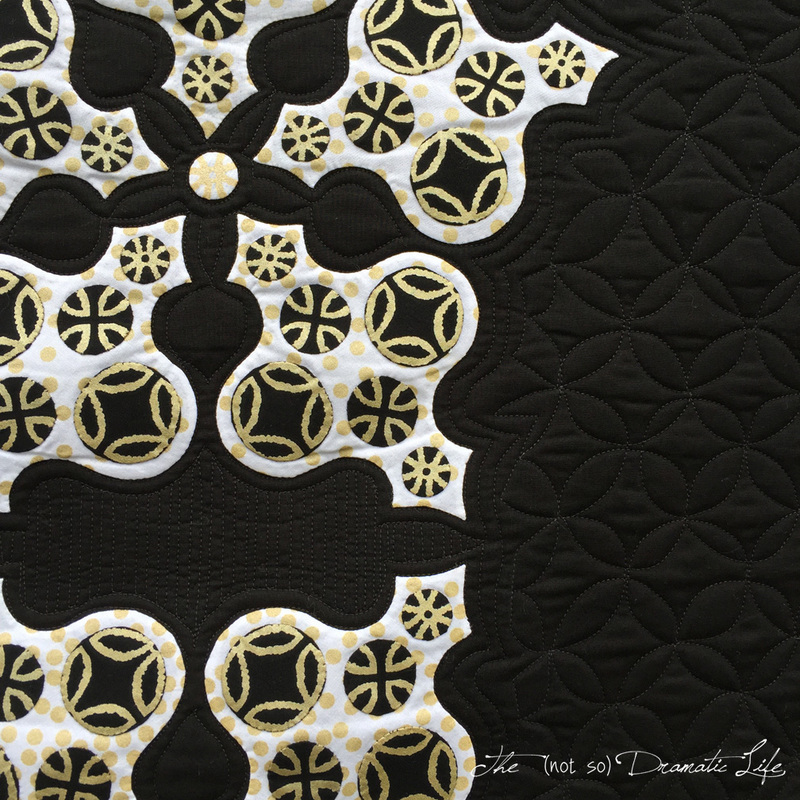 I am in my first block bee this year with The Columbus Modern Quilters. I signed up for the six month version since this is my first time, and I never know exactly where or how busy I’ll be in a year. In January our queen selected the Wanta Fanta block, and I was thrilled by how quickly it went together. This month we are making the same block for another queen, and I am even more excited to see how both of these quilts go together. 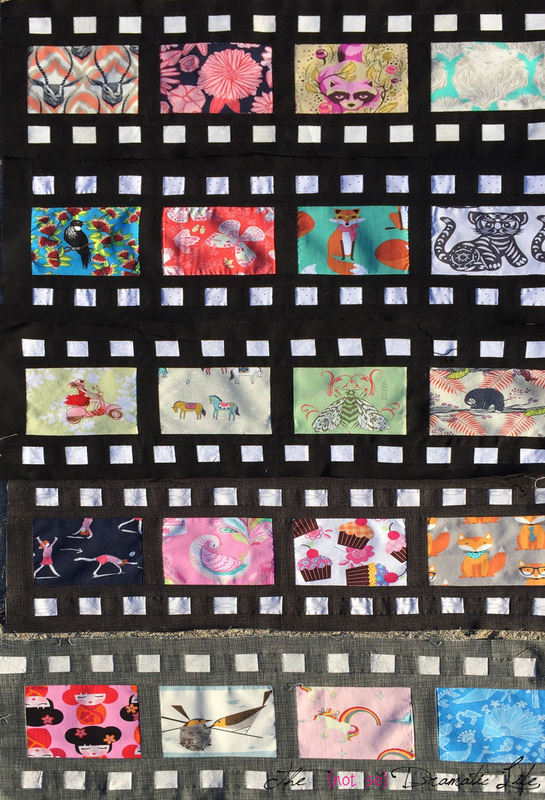 February was my month, and everyone made a filmstrip block that I will be incorporating into a border of a medallion quilt. I just love the blocks that everyone brought- Aren’t they awesome?! I have the free pattern available on Craftsy if you are interested in making some filmstrip blocks of your own. 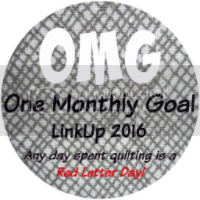 My February goal came with an added bonus: when names were drawn from the completion link-up, mine was selected! 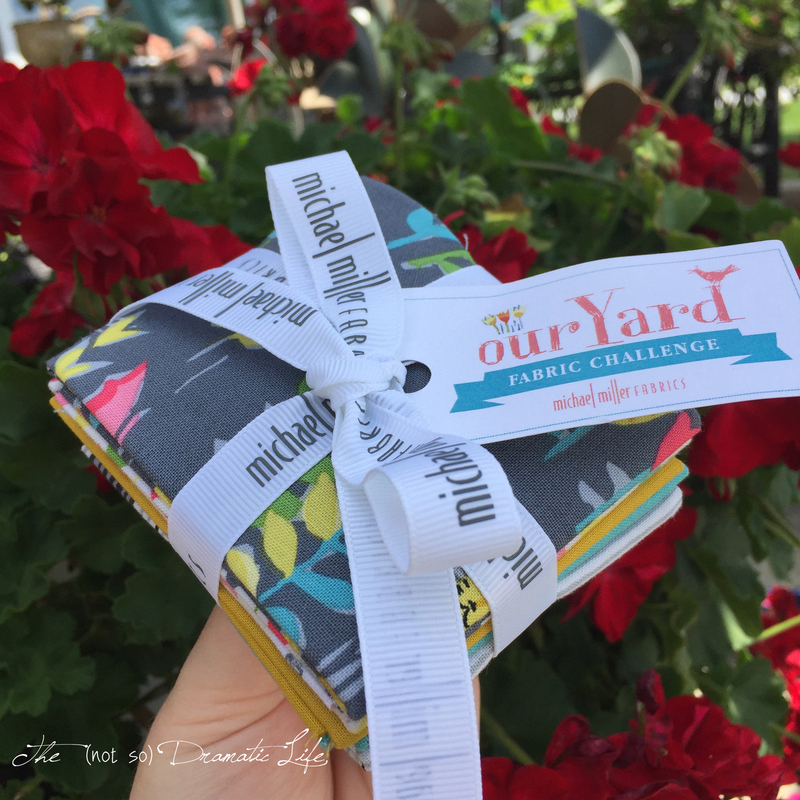 This lovely bundle of fabric arrived a few days ago, and I can’t thank Heidi of Red Letter Quilts enough for hosting this event every month and supplying lovely fabric for a prize! 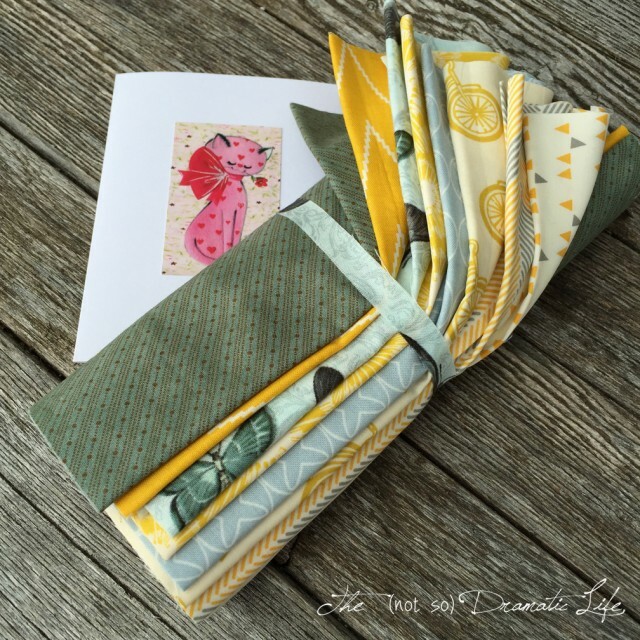 Last year I had a great time participating in the New Blogger’s Block Hop, so when the opportunity arose to participate in another New Block Blog Hop, I jumped at the chance. Paintbrush Studios sent out fabric to each blogger in the Ocean Sunrise Palette which was curated by our wonderful hosts. 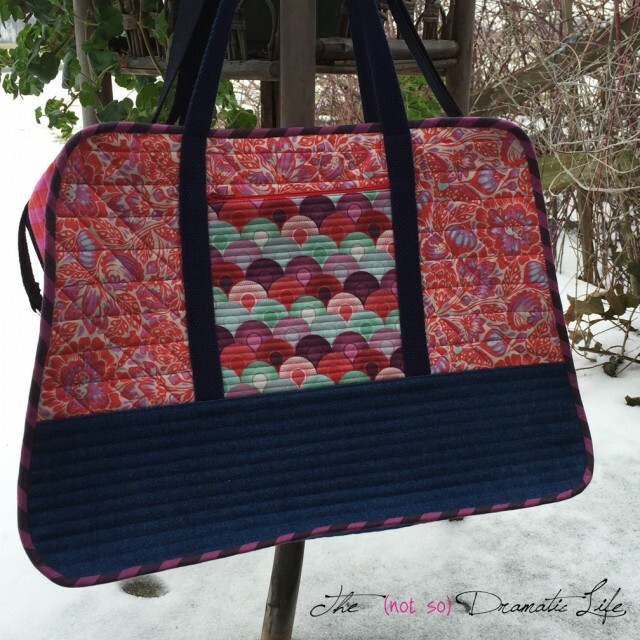 You’ll want to mark your calendars for March 28-30 to stop by and see all of the wonderful new block patterns that are being given to you by more than three dozen bloggers! 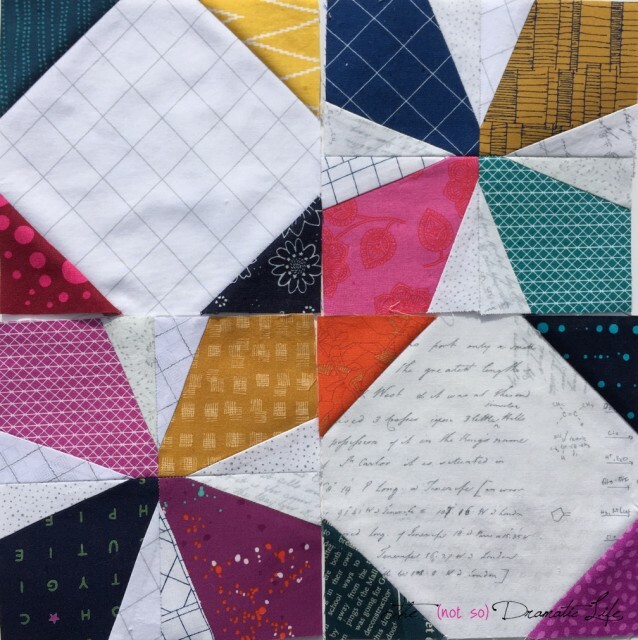 What makes this project even better is that all of the blocks created for this blog hop are collected by our hosts to make into some gorgeous charity quilts. 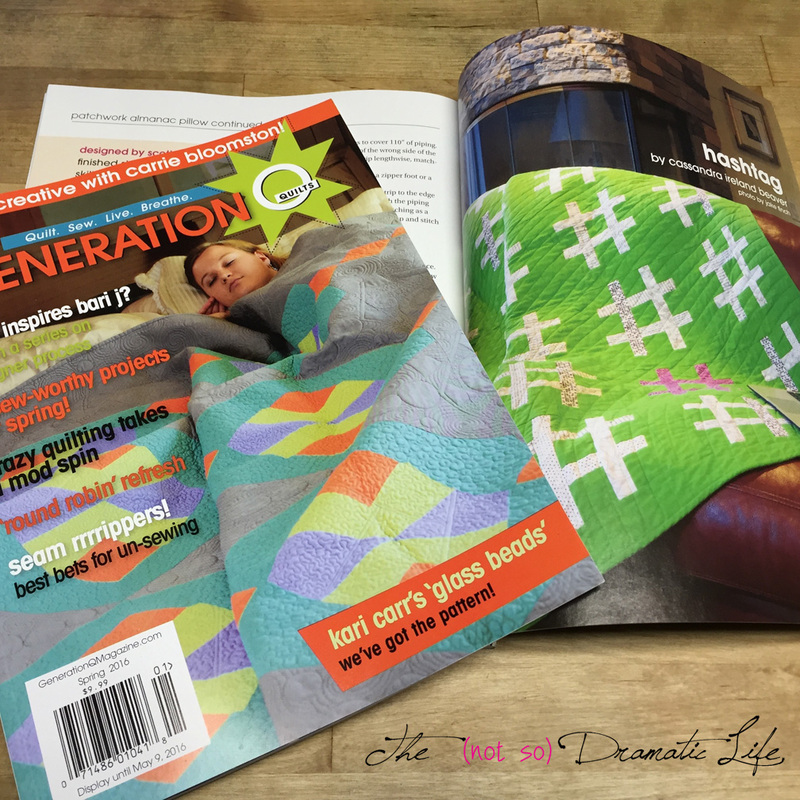 For the first time I have a quilt design making an appearance in the pattern section of a magazine. 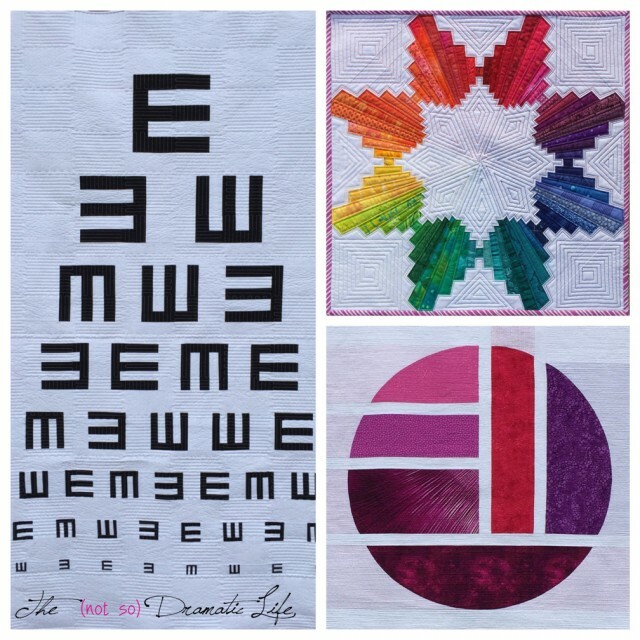 If you’re interested in making this Italicized Hashtag Quilt, make sure you check it out in Generation Q. I’ll be writing more about this quilt soon! 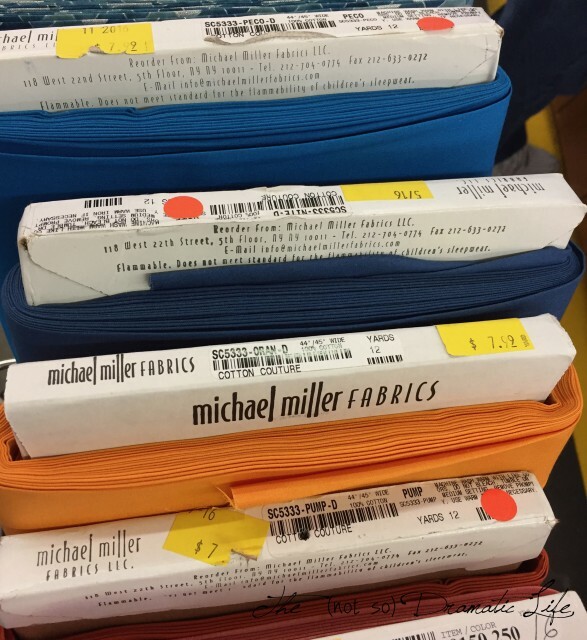 This summer, the Modern Quilt Guild (MQG) announced this year’s Michael Miller fabric challenge, and I couldn’t resist signing up. 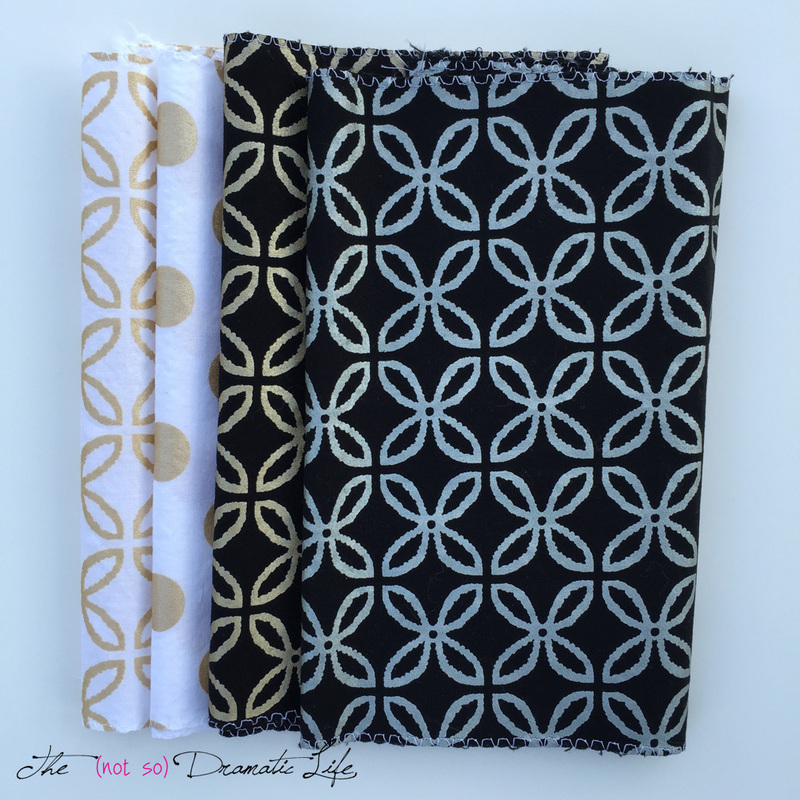 Those metallic prints are so much fun! I had an idea at that point, but once the fabrics arrived, I decided to change directions based on the exact prints that arrived. Glittery metallics made me think of shining stars and opulence. 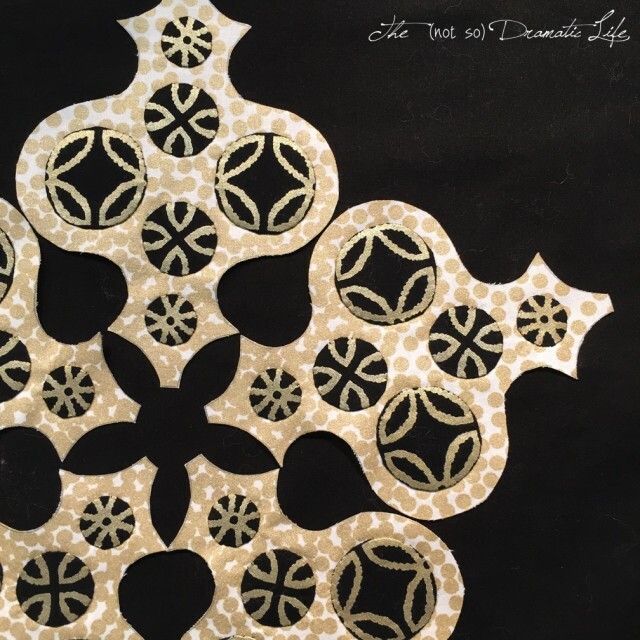 I typically prefer silver, but for this project I was really drawn to the gold printed fabrics. To supplement the package of fabric sent by Michael Miller, I purchased some of the white and gold confetti dot also from the Glitz collection, and a Michael Miller black solid. This design started with the fabric printed to imply interlocking circles. 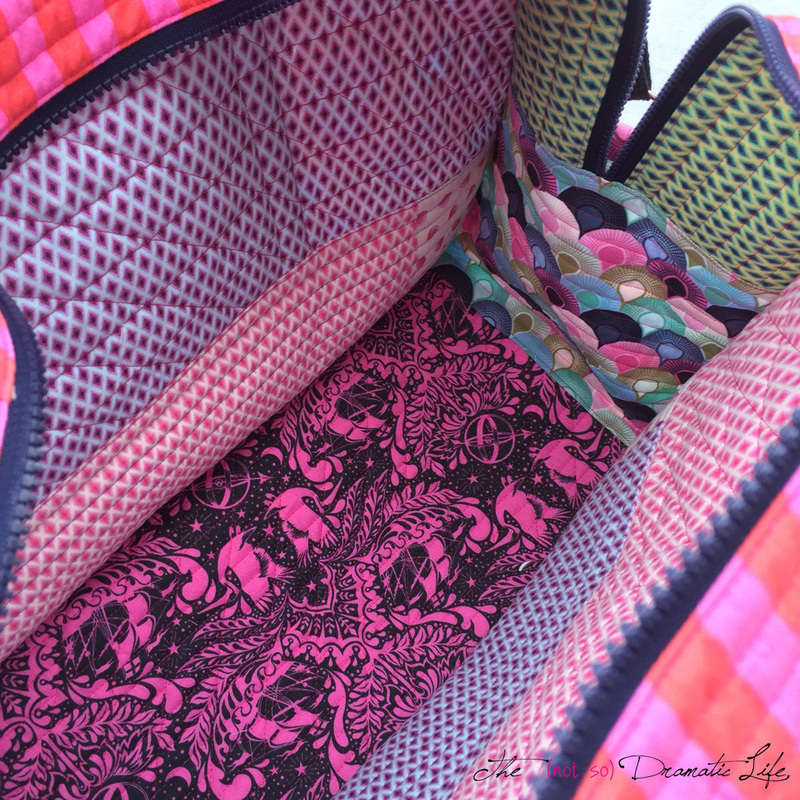 I started experimenting by creating circles highlighting different sections of the print. Once the circle sizes were determined, I drafted the motif that would create the final star design. 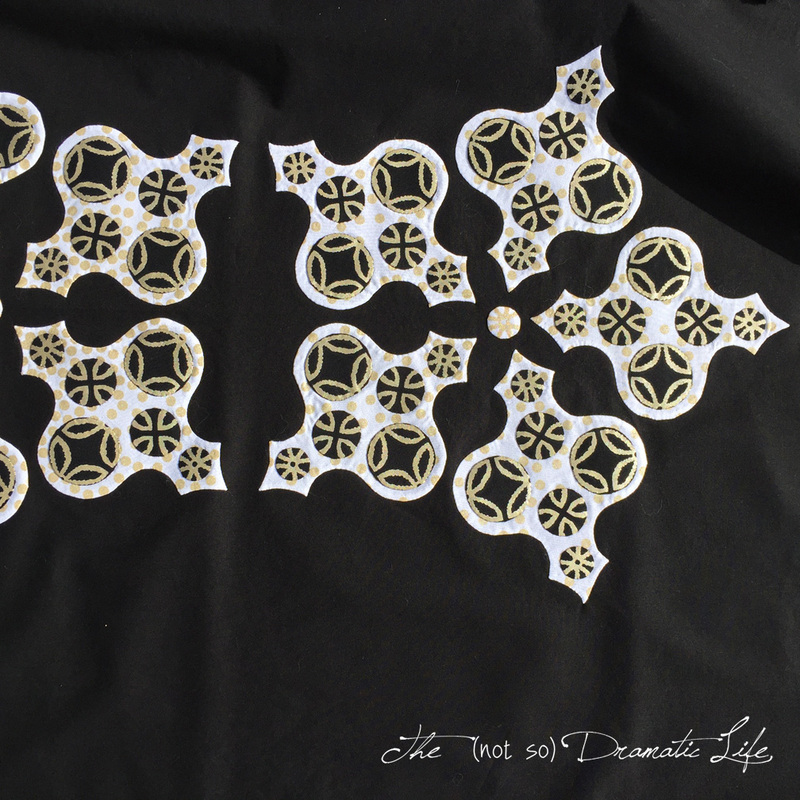 I started the construction by hand appliquéing the circles to the white background pieces. Those pieces were then added to the solid black background. 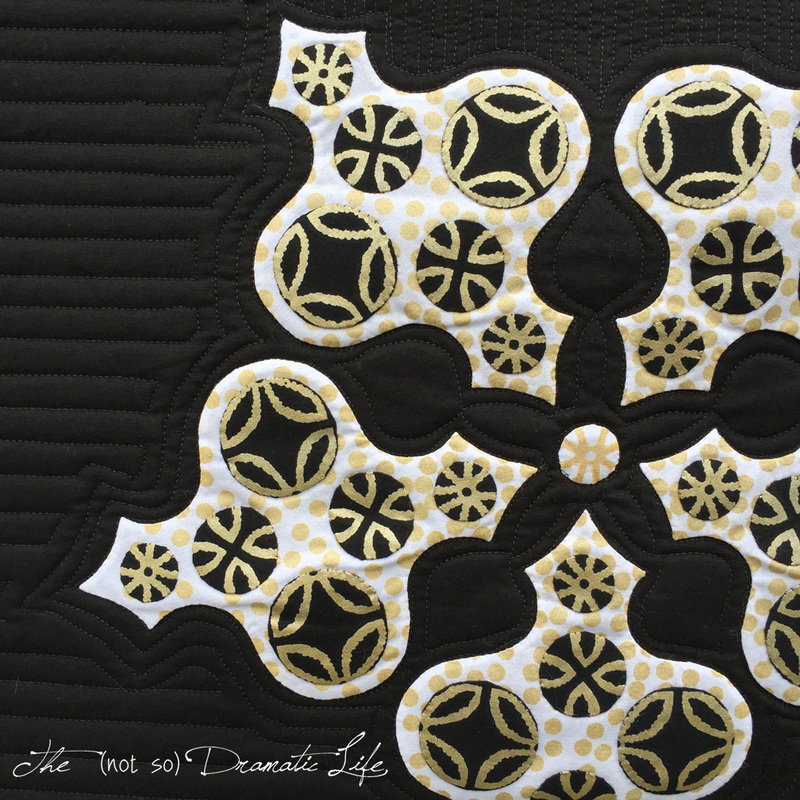 For the quilting, I wanted to break up the background by using different quilting designs on either side of the appliquéd star motifs. The quilting thread is a very dark grey which added a bit of extra dimension to the solid color surface. 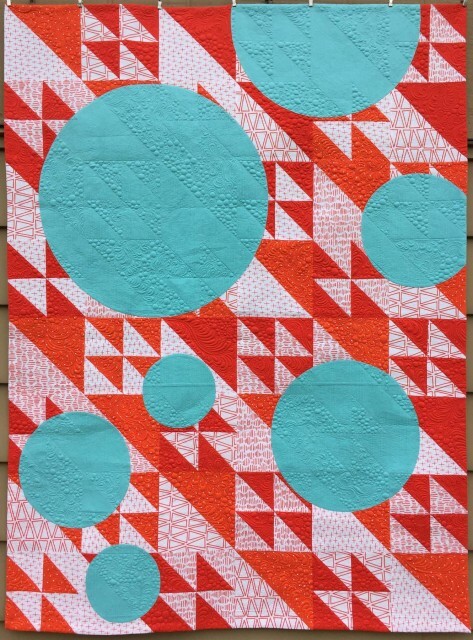 I used the longarm for this quilt and the circle pattern was entirely free-motion using a dot to dot technique. It is far from perfect, but it was the first time I had attempted this, so it could have been far worse! I tend to like a hand drawn quality in free motion quilting, so I ultimately decided to leave it in and embrace the character of the piece. The lines around the stars and the tightly spaced vertical lines are also free-motion, but for the horizontal lines on the left side of the quilt I did lock the machine on the track before hand guiding the stitching. 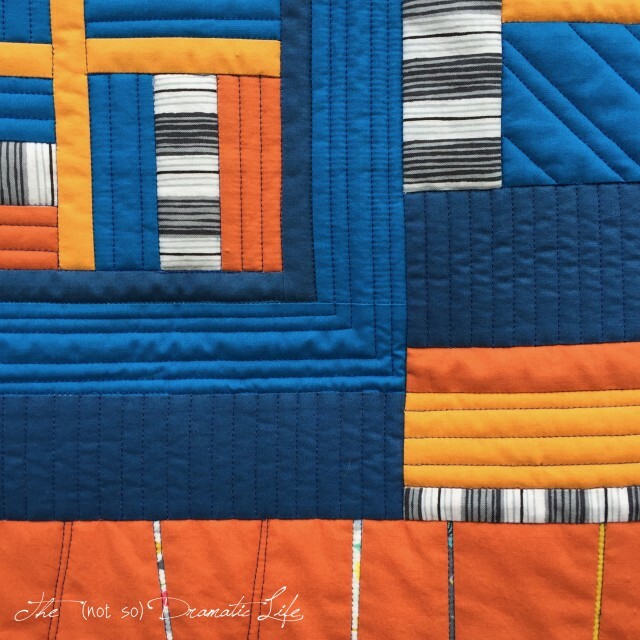 This quilt was one of my entries in to QuiltCon, so now I (like many of you!) 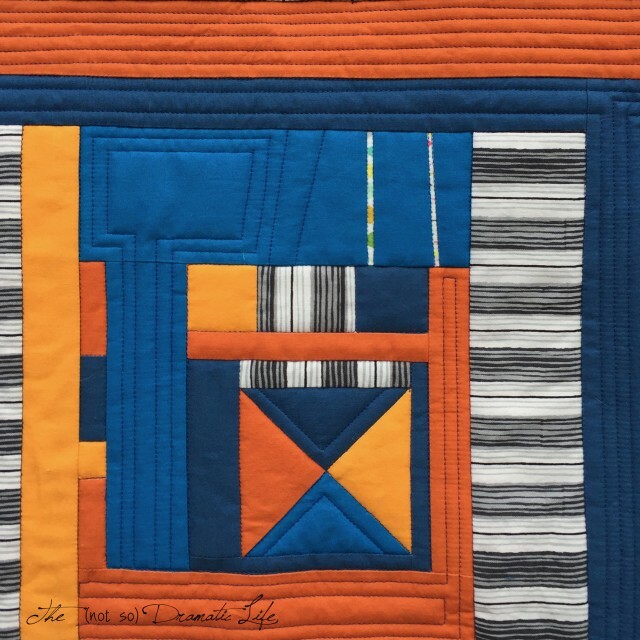 are waiting to hear which quilts we will see at the show in February.